Ever wonder what goes on in the cockpit of an aircraft during an emergency? Yeah, me too — and I’ve had a few of them in my flying career. Emergencies are like snowflakes and fingerprints: no two are exactly the same. Perhaps that’s why even experienced aviators find them as interesting to rehash as the general public. The only constant between them seems to be that they never quite match the experience received during flight training. That shouldn’t come as a shock to anyone who flies because there’s no way to simulate every possible scenario, especially when one of the tenets of emergency training is to avoid creating a real one in the process. Yes, simulators are one answer. But they are not a complete or perfect solution since even the very best sims can only create the scenarios for which they’re programmed. In other words, the usual textbook issues: engine rollback, depressurization, wind shear, runaway trim, electrical failures, instrument failure, and so on. The most challenging thing about training for emergencies is that there are so many possibilities that we can’t even think of them all. Aircraft are complex pieces of machinery and failures can happen in ways that even those who designed and built them cannot foresee. That’s when our intrepid aviator gets to start using all that experience and systems knowledge he’s acquired to try and puzzle things out. Two of my emergencies were partial engine failures. One was caused by a blocked fuel filter in a Pitts, and the other was a broken cylinder in a Cutlass. When was the last time you saw that simulated? In training, engine failures always seem to be given as complete and instant losses of power. But in my experience that’s not realistic. It’s at least as likely that you’ll have some power, but the engine is not running properly and on its way to eventual failure. Now things are even more complex, because in addition to the usual checklist items you must decide whether to shut it down. Will the vibration rip the engine off the pylon? Take a prop blade? At what point are you within glide distance of a landing spot and free to shut down the engine? If there’s smoke or fire, that will certainly impact your decision. What sort of terrain are you flying over? Are you in IMC or VMC? As I said, a long decision tree with many variables. Some people try to encompass every scenario with a single flow or list of actions. I find those solutions to be tortured and not well suited to every situation. 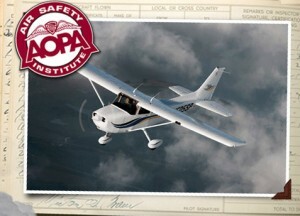 The bottom line is that emergencies often require critical thinking skills by the pilot, even if that thinking is as simple as “which emergency checklist is appropriate to this situation?”. A fellow Gulfstream pilot related a scenario where he had just departed from an airport and noticed that the Engine Vibration Monitor was indicating excessive vibration in one of the engines. The flight manual for that airplane says not to shut down an engine solely for a high EVM indication. The captain elected to reduce that engine to idle thrust as a precautionary measure. Then, the flight attendant who was occupying the jump seat in the cockpit told the captain that there was a lot of smoke in the back of the cabin. There was no smell associated with it, however, and no indication of fire either on the instrument panel or in the rear of the aircraft. It was almost a black fog. The engine was secured and an emergency landing carried out. The cause turned out to be a slightly loose fan blade in one of the engines. Centrifugal force was allowing the blade to rub on the case and the resultant material was being ingested into the pressure vessel via the bleed air system. I don’t think that’s a scenario I’d heard of before it was related to me by the pilot who experienced it. In training, smoke usually equals fire. Pyrotechnic damage to an F-86 Sabre. Click for the video. Anyway, I got to thinking about how we train for emergencies because of this video. In it, an F-86 Sabre pilot flying at an airshow is inadvertently hit with a pyrotechnic device in mid-flight. 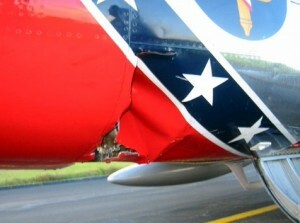 I suppose it’s analogous to battle damage or a bird strike. He reports that the impact was severe enough that it felt as though the jet had hit the ground. Then the airboss reports that the aircraft is shedding parts. Oh, and he’s at low altitude in an airplane with an ejection seat. What would you have done? The pilot in question, Ed Shipley, is a model of professionalism and thoughtful flying. He calmly ensures the airplane is stabilized and then worries about ATC. There’s no hesitation in declaring an emergency. Next he gets all the available resources working on his behalf. That means the airboss, the controller, even an F-16 sitting on the ground. Phone calls are made, people consulted, and Shipley gets as much information as possible about what’s happened and what to expect upon landing. With my theatre and opera background, I’d liken the pilot of an emergency aircraft to the director of an improptu play. To be fair, Shipley had an extensive array of resources available, but that very same help can be overwhelming if not managed properly. 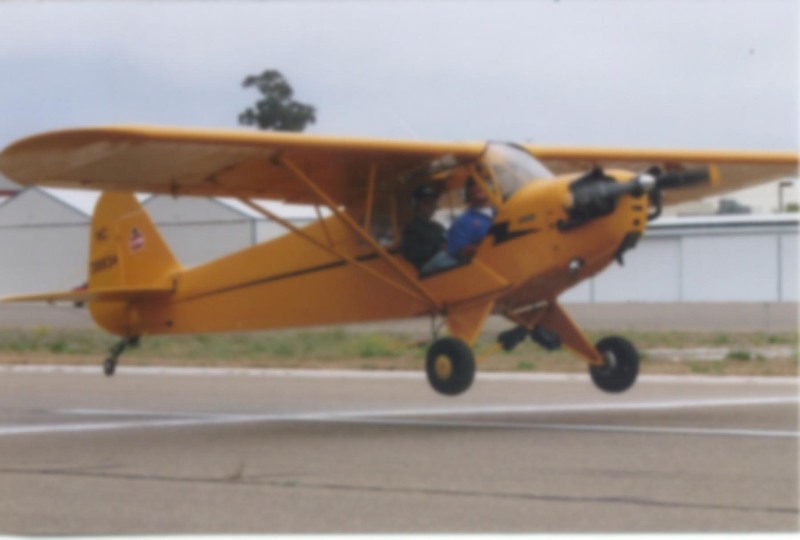 I once had an aileron jam due to FOD inside the wing of my airplane during an aerobatic competition and had that problem due to a long stream of questions and suggestions from those on the ground. They meant well, but it wasn’t what I needed at the time. Partial engine failure in IMC. Click for the video. Sometimes less-experienced pilots will allow controllers to direct their actions when things should be the other way around. You can find one such example in this Air Safety Foundation “Real Pilot Stories” narration of a partial engine failure (sound familiar?) in actual instrument conditions. The flight comes through in one piece, and that’s all that matters. But if you watch the presentation, you’ll see that even the pilot admits that he didn’t get the information he needed from the air traffic controller. His decisions were influenced by a person who is not a pilot and didn’t fully understand the details of the situation. Toward the end of the video, he recounts the lessons learned and in doing so sums up my message: the emergency you get isn’t always the one you’ve trained for. ← An Accident Waiting to Happen. Again. All interesting. I recount your stuck aileron story to people all the time as an example of how difficult it is to guess what could go wrong. And I recently wrote up my first real emergency: http://www.flyingsummers.com/2011/11/hello-i%E2%80%99m-a-failure/ which was not at all what I was expecting. Funny that you mentioned Mike Herbert at West Coast. He works on the DA-40 that I fly as well.